There are many factors that impact how you work. Small changes to your office space can do wonders for your state of mind and productivity. Whether you are in a home office or a large company environment there are many ways to improve your desk space and overall workplace design. It’s easy to be ergonomic in the workplace. First, make sure your body is front and center of your monitor and keyboard. Sit up straight with your shoulders back. No hunching! Adjust your office chair so your feet are on the floor and your knees are level with your hips. You can also use a headset rather than cradling your phone between your head and neck. Make sure your monitor screen is slightly below eye level and about arms lengths away. These all all simple and free improvements! Americans have an obesity epidemic – not only do we eat poorly but we also don’t exercise enough. Consider taking at least one short walk a day during work. Studies have proven that walk and talk meetings are some of the most efficient and productive meetings in a workplace. Encourage your team to take these! Bringing nature into your workspace can improve concentration and boost well-being. Plants also can remove contaminants and toxins from the air. 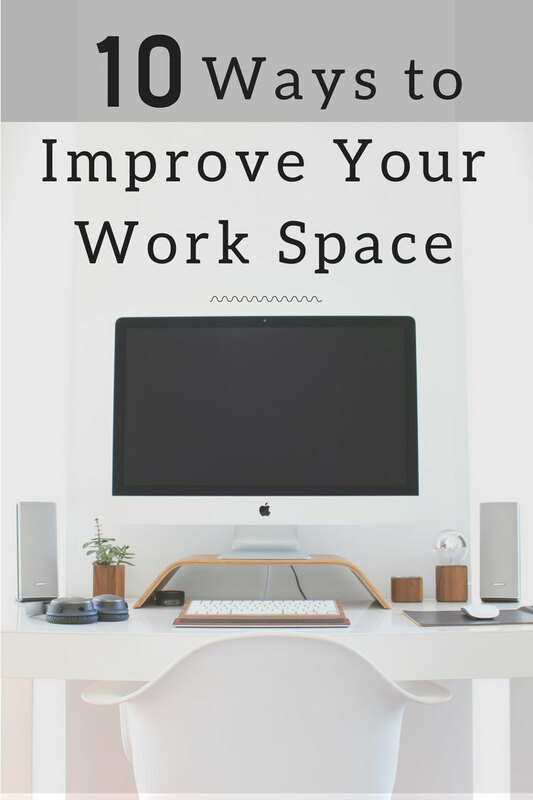 It’s one of the simpliest things to do to improve your workspace. Take time each morning and each evening to file papers away and put things in their place. Tidying up will help you focus, be better organized and remove distractions. Micro breaks are when you move around about every 20 minutes. It can be a short stretch or a walk down the hallway. It is shown to reduce back problems and discomfort. A quick break gives you energy and makes you more productive when you return to your desk. 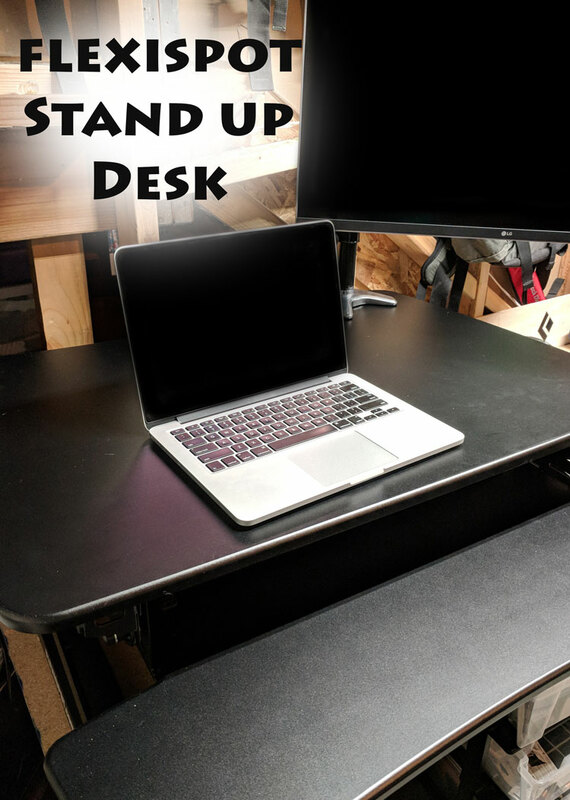 If you work at a desk all day you have probably wondered about getting a stand-up desk. Standing desks are very trendy, but they are also really beneficial. Studies have shown that standup desks increase productivity and are healthier for you when you rotate from sitting to standing for short periods. Sitting at a desk for too long has shown to lead to long-term health problems. It is no secret that sitting at a desk can cause back pain inflammation and less blood flow. So invest in a stand up desk like the one from Flexispot and your body and mind will thank you! Ideally you get natural light in your office space. However this might not be something you have control over. There are only so many windows in the office. However, you can easily invest in a lamp that imitates natural light. These lamps can reduce fatigue, improve mood, encourage positivity and even reduce seasonal depression. Studies have shown that smells can impact to our mood and mindset. They can increase focus and liven you up when you are working. Some good scents to keep you focused: pine, cinnamon, citrus and peppermint. Our brains need nourishment to run efficiently. Pack healthy snacks and avoid the office junk food. Make sure to stay hydrated with plenty of water. Drink at least one glass of water per cup of coffee or tea to avoid dehydration. according to over 24 studies on office temperature the optimal temperature in a business work space is 71 degrees Fahrenheit. If the average space in your office is dramatically different you may want to adjust your thermostat. This adjustable-height workstation is easy to maneuver. You can order this standup desk on Amazon and it comes right to your door. It takes less than 5 minutes to set up. And you’re ready to go! 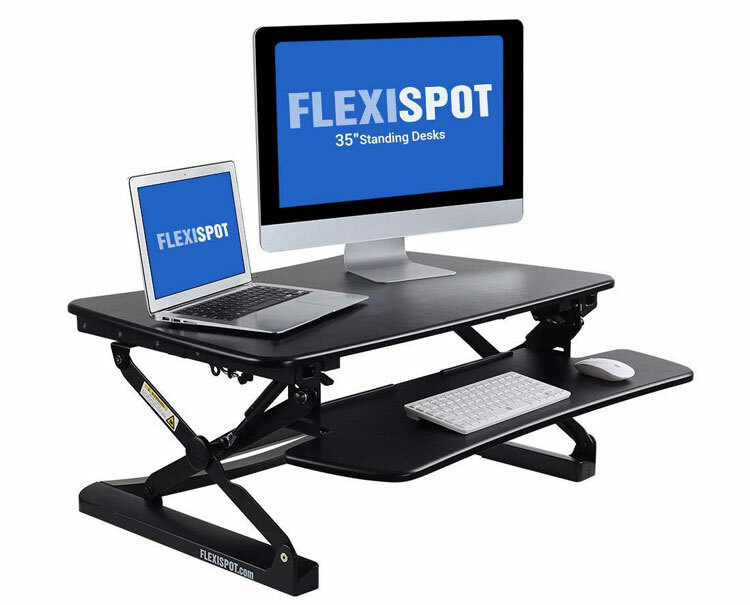 I have been using the Flexispot stand-up desk and I feel more awake and less stiff. I feel generally happy that I have an option to either sit or stand while I’m doing calendar invites, responding to emails, writing reports and more. Even though I am at the computer all day – I feel more flexible with the option change positions every so often. I found my sweet spot for standing is about every hour. I switch standing and then back to sitting throughout the day. It gives my legs and feet some rest about every hour when I sit and then re-adjusts my focus when I go to stand. Special Discount: Right now get the standing desk converter at a special price. This deal starts July 16th 3 pm ET: 30% off $224.99 (was $329.99) – If you’ve been wanting a standing desk, don’t miss out! What changes do you want to make to your business office?